Running a company, raising a child by myself, dealing with a house renovation, and trying to have a social life sometimes feels like I don’t have any time. I can easily go into overwhelm. But that’s an illusion. I have plenty of time; not to do everything, but only to do the important things. I can’t spend time catching up with HGTV, reviewing the work of one of my employees who is totally competent, and writing a blog which shares my heart and tells people about what is important to me. I have to choose. I saw this last week when I was going through a hundred things I had to do. I realized that the only thing that had to get done that afternoon was to pick up my son from school. Everything else was important, but they could wait until the next day. They were not urgent. It is very rewarding to put it in those simple turns that Stephen Covey uses in his time management matrix. 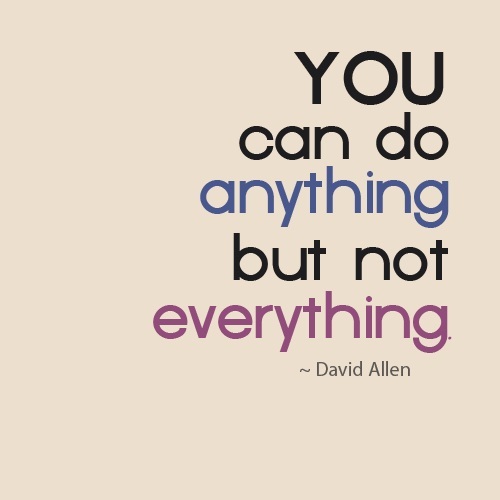 David Allen, another great time management guru, also puts it in simple terms. "You can do anything—but not everything." Working out what is important and crucial is a good first step. For me, it was my son. I hope I always remember to make that choice.